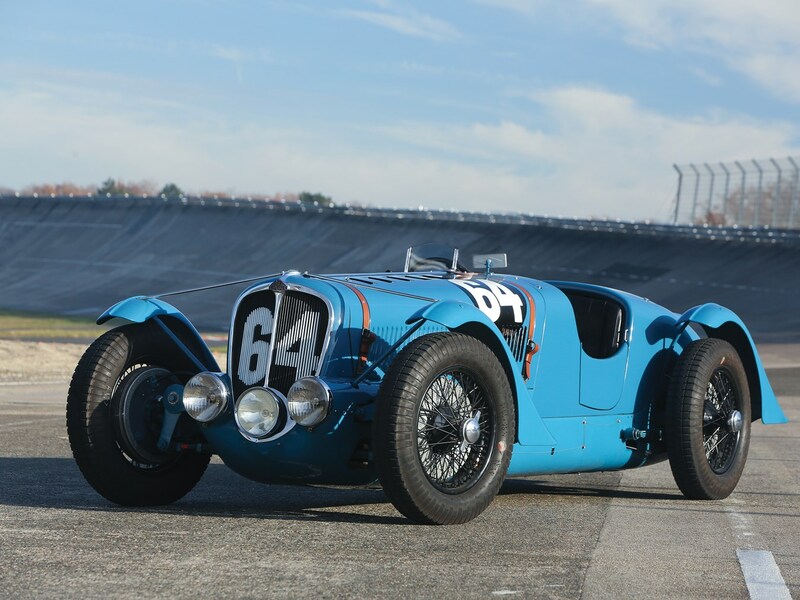 The history of Delahaye goes back to the very beginning of the motor industry. Emile Delahaye was a French engineer who bought a factory that manufactured brick kilns and items for the ceramic trade. To help with the industrialisation, he started to work on pumps and engines – both steam and petrol based internal combustion versions. He initially saw this as a way to power his factory as well as other products like ships. In 1894 he took a slot at the Paris Motor Show to introduce his first car and he also entered some of the first motor races as a driver/builder. The success of this enabled him to put his cars into production. However to do so, he relinquished some control to a couple of industrialists who helped him set up a new company – Societe des Automobiles Delahaye in a new factory in Paris. The first cars were belt driven with a rear mounted two cylinder motor and the final drive was undertaken via chains. By this stage he was in his mid 60s and in 1901 he left the company for health reasons and died four years later. With no heirs, the management of the company was transferred to Charles Weiffenbach. Although the new management agreed that motor sport was an important marketing function, they wanted to develop very reliable vehicles and branched out into trucks, light commercial vehicles and military equipment. They initially concentrated on delivering commercial vehicles with a small range of 4 cylinder 1.4 and 2.1 litre motors or 2.5 litre V6 powered cars for the mid market segment. It was an engineer at Delahaye who invented the V6 configuration. Like many manufacturers they made armaments such as shells and rifles for the war effort during WW1 and also Hispano-Suiza aero engines under licence. The pump business also combined with the truck side to create a very successful range of fire engines! This served the company well and they survived the Great Depression partly through a partnership with Chenard et Walcker another French manufacturer who were the winners of the very first Le Mans 24 hour in the 1920s. The two companies shared components, which helped keep costs down. As the 1930s continued, Weiffenbach commissioned a young engineer to develop a new sports car as this segment was getting very popular. Delahaye used Talbot independent suspension with one of their own truck engines. The 12CV and 18CV models were introduced at the 1933 Paris Motor Show. Whilst visiting the show, Lucy O’Reilly Schell, a wealthy American met with Delahaye and agreed to underwrite a new sports car so she could go rallying. The result was the Type 135 with a 3.2 litre motor taken from one of their smaller trucks and capable of between 96 and 120 hp based on road, semi or full race specs. Touring and race versions were developed with the race version having the gearbox fitted lower in the chassis to aid stability. Typically the cars were delivered to a coach-builder as a rolling chassis. Incidentally, Lucy’s son Harry, later became a Grand Prix racer in his own right. In 1935, Delahaye merged with Delage, founded by Louis Delage who came from the same town as Emile Delahaye and built sports racers. Delage was hit badly by the Depression and Delahaye built the Delage cars up until the early 1950s. Success continued in racing and production was steady through to the Second World War – even Renault acted as a coach-builder for the Delahaye Type 168 model. After hostilities finished the 135 was put back into production until 1948, when it was replaced by the Type 175, which was fitted with a 4.5 litre engine. Sales started to slow as the French Government were heavily taxing luxury cars (what’s new!) and Delahaye was starting to build the Type 235, a coupe with a 3.5 litre straight 6. This did not stop the slide and in 1954 they were acquired by Hotchkiss, another French manufacturer who badged up the last models as Hotchkiss-Delahayes until production stopped in favour of building the Willys cars under licence. Only about 100 of the 235s were built alongside the Type 148. The featured image is an example of the 235, which was on show at the Blackhawk Museum in Northern California. In the US there is a company called Delahaye USA that hand builds cars that are in the style of a 1930s Delahaye, Duesenberg or Bugatti, only they have modern drivetrains and equipment. The company is completely separate from the original name plate which I believe is now owned by Thomson SA, a French electronics company, which merged with Hotchkiss – Thomson is in fact the French offshoot of General Electric founded in the early years of the 20th Century. Anyway, have a look at www.delahayeusa.com for some amazing designs that could have come from a Batman or Great Gatsby movie! A similar type of coach-builder is Deco Rides of New Jersey. Have a look at www.decorides.com as well. In 2015 a concept called the Delahaye 94 was created by designer Paul Breshke. The plan (or hope) was to get someone with the facilities and funds to get it into production. It still remains a pure concept unlike many remakes that had a big announcement, lots of activity and then nothing. First published: 19th January 2018. Last updated (links): 14th September 2018.